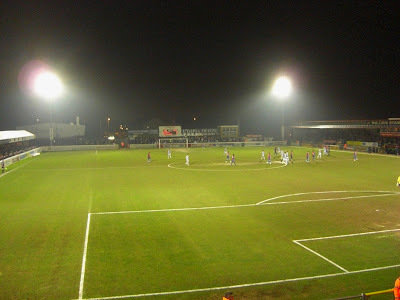 My fourteenth stadium of 2011 was on Tuesday 8th March 2011 at Victoria Road in Dagenham, London. The match was Dagenham & Redbridge vs. Colchester United in Football League One. Me and my friend made the journey across to Dagenham East tube station before taking the short walk to the Victoria Road ground (currently known as the London Borough of Barking & Dagenham Stadium). The ground has been home to Dagenham and their previous incarnations since 1955 though the stadium has been used for football since 1917. Victoria Road consists of three all-seater stands and two terraces. The west side of the ground sees the largest all-seater stand - the Marcus James Stand. This stand, opened in 2009, is the newest in the venue and can hold 1,200 fans. Despite this being the best stand in the ground it is given to away fans so is where I watched the game from. The south side of the ground sees two stands - the 800-seat Carling Stand and the 200-seat Barking College Family Stand. On the opposite side of the pitch is the most substantial terraced area - the North Stand. This stand is covered by a roof unlike the other terraced area, the Bury Road End, which sits behind the goal in the east side of the ground. This uncovered section is a classic old terrace with a large scoreboard positioned above it. The spectacle on show was absolutely dismal and certainly the worst game I had seen up to this point in 2011. There were few chances and the only goal came early on for Dagenham. Lots of long-ball hoofing from both sides, but Dagenham were the better team on the night as they only played poorly as opposed to Colchester who were utterly woeful. Not worth the £22 it cost to get in, that's for sure!